GUITARIST MICHAEL SCHENKER DISCUSSES UFO, THE ROLLING STONES, AEROSMITH, OZZY AND PLAYING GUITAR WITH HIS FEET?! 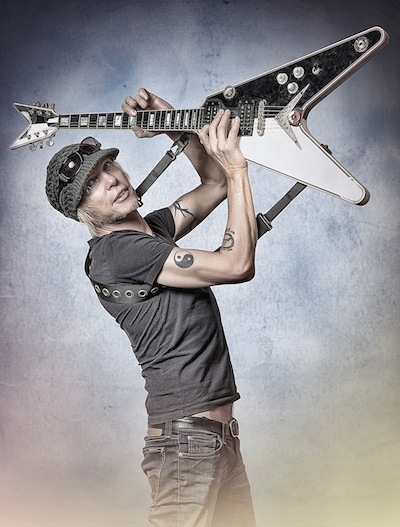 Greg Prato of Songfacts spoke with iconic guitarist Michael Schenker. Excerpts from the interview appear below. Songfacts: How did the songwriting work in the band UFO? Was it more of a collaboration? Michael: Well, when I joined UFO, they were a psychedelic band. They were playing very different music. But I was attracted to them being British, since that’s where the music that I fell in love with came from: Zeppelin, Black Sabbath, and Johnny Winter. Well, Johnny Winter was American, but a lot of the music that we were listening to at that point in time when I was 15 years old was coming from there. When I toured with UFO and Scorpions, the guitarist from UFO lost his passport, so in order to continue the tour, I had to play for both bands. That was when I was 16 years old. I opened up with the Scorpions and then I played with UFO for a couple of days. And that’s when they asked me to join them. I always told the Scorpions that if a British band would ever ask me, I would go just to get to a country where there was the interest for rock n’ roll. In Germany it was dead. It was disco music and it wasn’t very interesting what I was doing. So I was more than happy to go over there. They invited me over and I took the offer. When I got there I just laid down a riff and another one and another one, and Phil [Mogg] did his vocals to it and it just became a totally different band based on the pieces that I gave them, which every song was built on. I wrote that way right from the beginning, and it’s still how I write today. But because I had just joined them, we were more in the mode of making a record, touring, making a record, touring, making a record, touring. Because we were doing everything in the short amount of time, we spent a lot of time at the rehearsal studio. Some very early songs, like Rock Bottom, were very spontaneous. We were just sitting there looking for an additional song, and when I played “Rock Bottom,” the riff, that’s when Phil jumped up and said, “That’s it! That’s it!” So we started putting it together and putting it into form. But in general, I would always come up with some riffs, give it to the singer and he would find something, too. Then we’d go into the rehearsal studio and work on it. That’s basically how we used to write. Songfacts: You just mentioned the song Rock Bottom, which I was always a big fan of. The studio version and the live version are a bit different, as the live version had a long jam section. How did that come about? Michael: Well, Rock Bottom has that piece in the middle of free expression, and it’s perfect for me because I love pure self-expression. It’s a really, really good part to play over that particular chord there, and it leaves a lot of space to come up with a whole bunch of creative ideas. Over the years, the solos have changed. I keep the basic structure of it, but there is a lot of space to put new “sparks” on here and there and keep it fresh. It’s always enjoyable to play over and over and over, because I can be very creative with it on the spot. That’s a very fascinating, enjoyable part of music for me. Songfacts: Another favorite UFO song of mine is the song Lights Out. Was that song pretty much the same, that you came up with the riff first and then it was a collaboration? Michael: Well, on songs like Only You Can Rock Me or Lights Out, Pete Way would come up with (guitar sounds – play the clip to hear), and that was it. Then I get inspired by that and find the additional parts. Or in the other song, that kind of happened quite a few times, too, that Pete came up with, like, Only You Can Rock Me, for instance (guitar sounds). But that was it. And then I added all the other pieces to it. If it was complete or just a riff or anything that sounds good or inspiring, we had enough people in the band that would create additional parts to it. Like, Paul Raymond is a very good songwriter himself, so he would also come up with stuff. I think most of his songs were complete. Most of Pete Way’s were just riffs. They needed additional ideas. And my stuff usually would be a riff and a bridge and a chorus, but not necessarily a complete, ready song. Songfacts: Is it true that the UFO song, Lipstick Traces, you played that whole song with your feet? Michael: I was about 18 years old and I don’t know why I was thinking or what I was thinking. I don’t know. Maybe I was thinking, “I wonder if I can play with my feet?” And so I was just wondering if it was possible. [Laughing] So I started playing Lipstick Traces with my feet, and I went, “Wow, it is possible.” I played it to Andy. Songfacts: So the actual studio version is you playing with your fingers, right? Songfacts: I’m glad that I had the opportunity to ask you that, because I’ve always been curious about that, if you were playing with your feet or your fingers! Michael: Yeah. I didn’t in the studio, no, no. The studio was with my hands. It was an experiment. Songfacts: Is it true that you were asked to try out for the Rolling Stones back in the ’70s? Michael: Yeah. When UFO invited me, I came over. I was only over in England for a few months and then I get a phone call from someone asking me to audition for The Rolling Stones. I was very, very scared. [Laughing] I called my brother and told him and said to him, “What shall I do?” I was very nervous about it. I never called back and I left it. I had joined UFO, I’m 17 and very shy and very sensitive in a country without any knowledge of English. It was quite a big step already. So when that came my way, I remembered images of The Stones in the paper. First of all, Brian Jones had just died. And then I saw pictures of The Stones looking at each others’ lice. I mean, like, in the hair, looking for lice! The whole image that The Rolling Stones had, I was scared that it was a dangerous thing to be with them. UFO and Great Britain was a step that was big enough at that point in time. Songfacts: Did you also try out for Aerosmith a few years after that? Michael: Yeah. That was when I was finished with UFO and Peter Mensch started managing me. They flew me to New York just to see what the Aerosmith situation would be like, with Joe Perry not being there. I went there, but we never really got to play, because Steven Tyler wasn’t in any good shape. I was sitting for five days in a hotel, waiting. I wasn’t in the best shape myself, and so it never really got to anything, other than when I started my first songs for the first MSG album [The Michael Schenker Group], I actually went in with Joey Kramer and Tom Hamilton after that time, because Steven Tyler went to a hospital and he disappeared. I was getting ready for a solo album, and Joey Kramer and Tommy Hamilton, they wanted to do the rhythm section. So I went to Boston and we started to rehearse, and then Steven Tyler got better and they started Aerosmith. Then I got my next lineup with Denny Carmassi on drums and Billy Sheehan on bass. That lasted for a month. I almost got Geddy Lee and Neil Peart to help me out on that – we talked about it and they almost did it. We knew each other from the UFO days. We toured a lot together. And then I ended up with Mo Foster and Simon Phillips, who was with Jeff Beck. Songfacts: How close did you come to joining Ozzy Osbourne’s band after Randy Rhoads’ death? Michael: That was around ’81. Graham Bonnet just came over and we started writing and doing things, and then I get a phone call in the middle of the night from a very devastated Ozzy Osbourne telling me what happened [Rhoads was killed in an airplane accident, on March 19, 1982]. I said, “Okay, it’s the middle of the night. I’ll let you know, but I have to speak to Peter Mensch” and so on. And then I had to look… I was tempted to do that, but at the same time I was in the middle of doing Assault Attack and it was going to be the second album with Cozy Powell. We were getting ready, and I had to look at my situation. Then I heard some crazy stories about Ozzy dragging people across the stage by their hair and stuff like that. And then some other horror stories that didn’t sound too good. I was tempted to do that, but something tells me, you know what, Michael, first of all, the Scorpions, my own brother, he asked me to play, to help the Scorpions and to join them and tour with them. And I couldn’t do it because I’m not made for copying people. I love to invent things, to express myself, and so my vision is a different vision. Sometimes you have to battle a little bit with your true vision and temptation. Same with Aerosmith: It was a good thing it didn’t work out, because again, I would have not enjoyed myself. I know that. At the end of the day, I said, “I can’t do that.” It came to the point when I stretched it for so long that I think Cozy Powell took it over and told them, “He’s not going to do it.” And that was that. It was a very strange situation. Despite a couple snotty know it all responses in which perhaps they might try to arrange their own interview, this was a good story, as a longtime fan of Schenkers work since his his early work with the Scorpions. Good on him, and the spirit of true creativity! What exactly went down between Schenker and Bonnet and the Assault Attack lineup? I’ve heard disastrous stories about the Reading Fest, but that album and lineup killed! So disappointed Schenker followed up with Built to Destroy. A few good songs, bit dismal production and nothing like Assault.